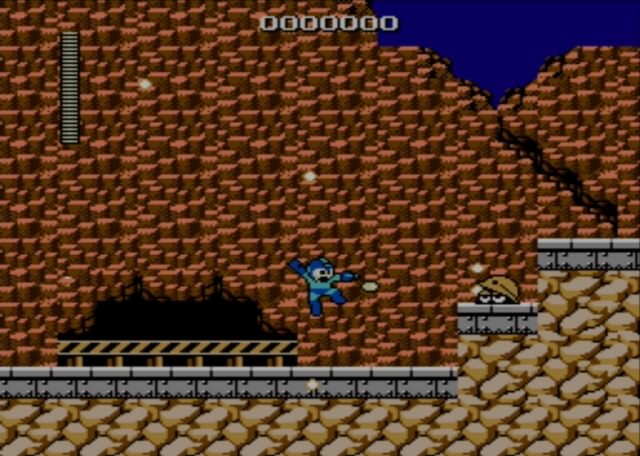 One of the most demanding sequences in the entire game waits for you as you begin the Guts Man stage, but the area's boss is a fairly simple foe and you'll want to have his ability sooner rather than later. From the start of the stage, head to the right. 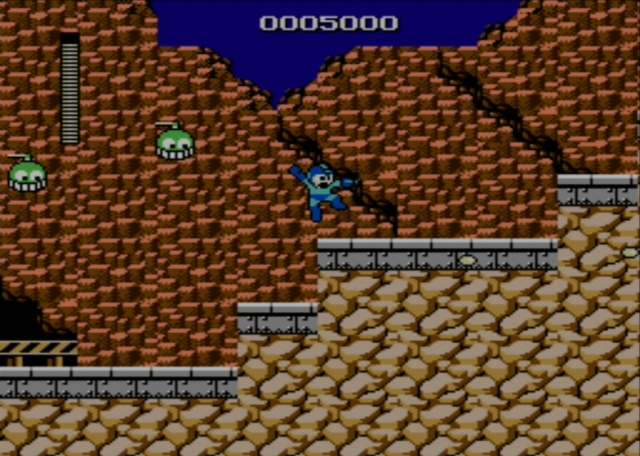 There are a series of ledges here that form a staircase, with hardhat enemies positioned along them. These fellows won't take damage until they emerge and fire a spread shot as you get near. From a mid-range distance, you can fire a shot and then follow it forward so they pop out of cover just in time to take a bullet to the face. At the top of the steps, look to the right. There's a large opening, with what looks like a thin platform to the right. Listen to the game's audio, though. You should hear what sounds like a whirring. Wait where you are, and an actual platform will come into view, cruising along the cable. 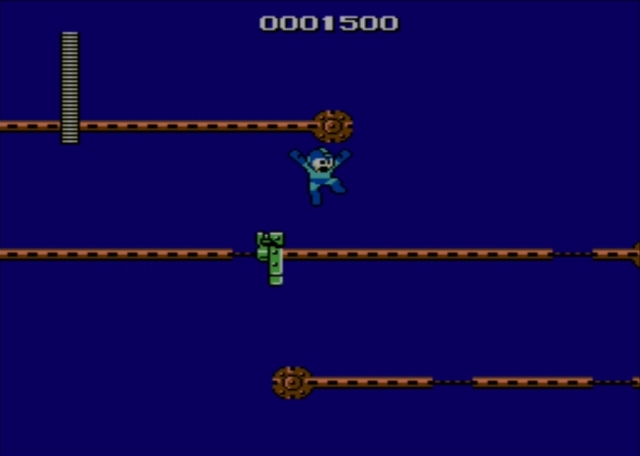 You can jump onto that moving green platform, and ride it along one of three such cables to the right, but only where the cables aren't stripped. Watch for the exposed areas of the second and third cables, which are narrow and mostly black instead of vaguely bronze. As your platform is about to touch those, it will drop so that you are deposited into the bottomless pit. Such a drop costs you a life. So you need to jump over the stripped bit of cable, but you have to wait until very nearly the last possible instant or you'll arrive on the far side ahead of your ride. Which is also fatal, of course. From the first, highest cable, you want to jump to the middle level as the green platform has just passed the stripped wire on its way left. That gives you a moment's rest before you have to jump over the stripped wire as the platform returns toward the right. Most of the way in that direction, you'll prompt a green platform to appear on the lowest level. The timing in this area isn't always the same, so be ready to ride your current platform back to the left (and across the same bits of stripped wire you recently crossed) if necessary. Of course, your goal is to ride along the lowest platform as it heads back to the right, which is most easily accomplished if you begin your ride from the far left of that lowest cable. 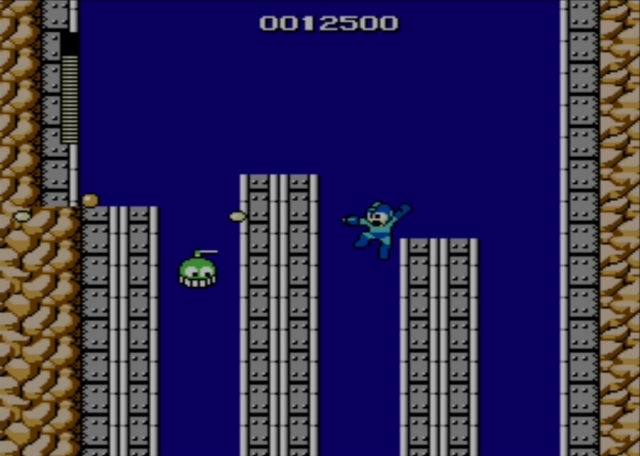 You'll have to jump regularly to clear several stripped bits of wire, and you want to keep near the right side of the green platform each time you land from a jump. 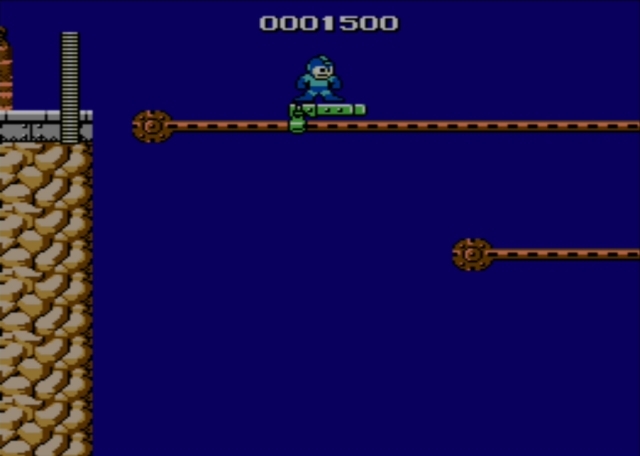 As the platform reaches the far right side of its route, you have to make a long jump to solid ground to the right. There, you'll be greeted by some flying green enemies. As they approach, they like to move upward or downward in arcing paths, but if you're ready, you should be able to blast them out of the air and maybe even drop some goodies. Contend with several such foes as you advance to the right and climb to higher elevation. Grab the energy capsule along the way, if you need it. When you drop down from high ground to a much lower girder and continue right from the energy capsule, you'll meet new armored enemies that throw pickaxes. You should try to blast them a few times as they approach, and shoot some more in a hurry while being ready to jump their hurled weapons. Whatever you do, don't backtrack left too far to get some distance, or you could very well prompt another one to appear as you head back to the right. 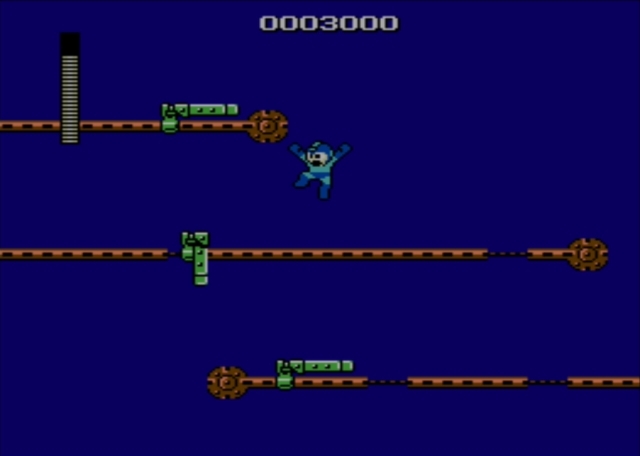 There are several of those enemies, and you'll have to jump carefully between girders while avoiding a bed of spikes. Then you'll reach the far right side of the area and can drop down a vertical shaft. As you fall into the next screen, hold left so you land on the rightmost of three vertically-oriented girder duos. There is a green flying enemy to your left, which will approach as you appear. Blast it out of the sky and drop down the first chute, holding right. You'll drop into the next screen and should manage to slide into a space to the right, where there's an energy capsule. Then you should drop left and veer in that direction as you fall to yet another screen below. Here, you can land on a floating pair of girders. And from there you can try to press left for a 1up, though I've never had luck reaching it. Then you can drop into a pit below to descend to the next screen. 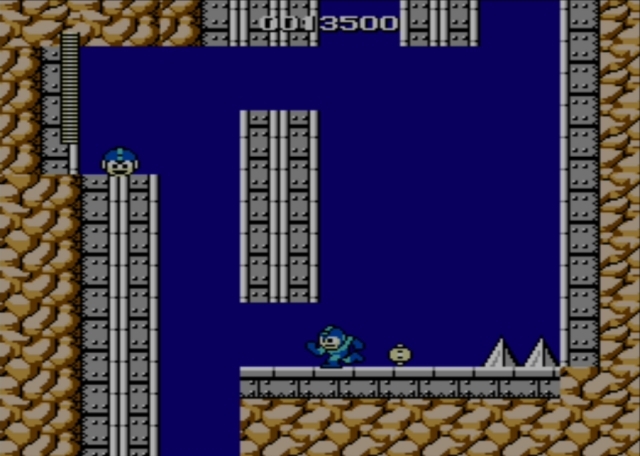 The blue enemy you see to the right here likes to collide with you, and will eliminate almost half your life meter on contact. It does take large hops sometimes, so you may be able to just run under it without incident and press onward toward the right before it can catch you. Or it might hit you once, and then you can dash in that direction while you are temporarily invincible. If you have the ice beam, which is unlikely, you can freeze the robot in its tracks for several seconds by firing a single well-placed shot. Beyond the guard, there is a gate that admits you to a lengthy, narrow corridor. More of the hardhat enemies are here, so battle them for a while if you need the energy items. 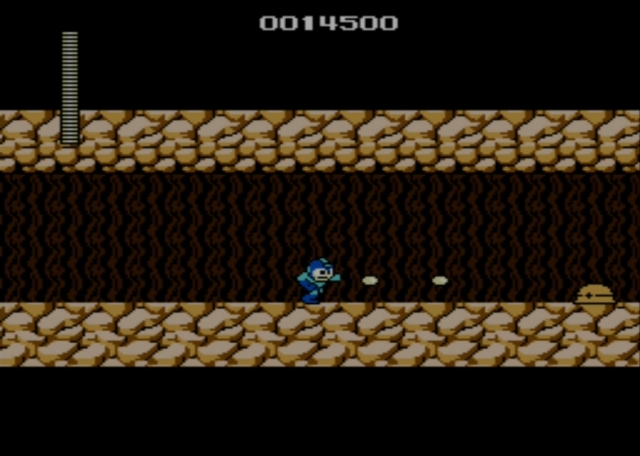 On the far right side of the passage, a second gate leads to the area boss fight. 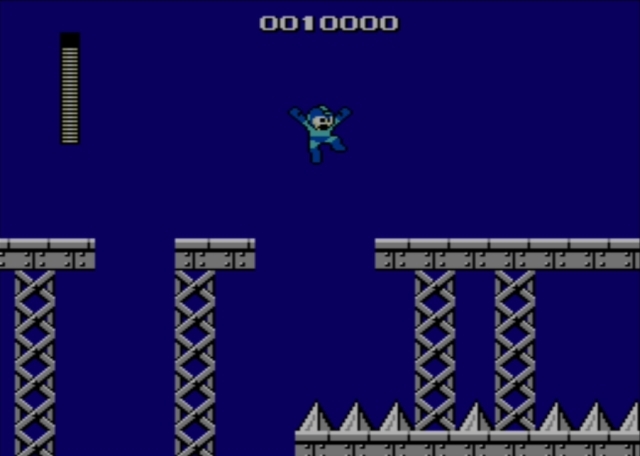 Guts Man is a bulky foe who is able to make the ground shake merely by jumping in the air and landing again. He also can toss huge blocks your way, which do moderate damage when they collide. As you begin the battle, you'll find yourself standing on two large blocks that will remain for the battle's duration. A perfectly viable strategy (and essentially the easiest one) is to remain where you are, facing right toward your foe. 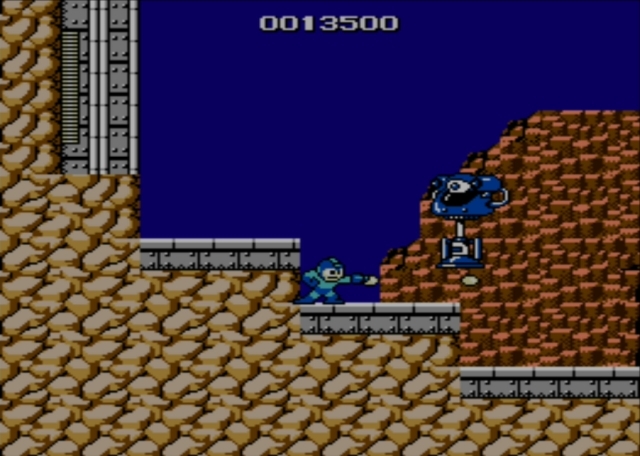 As Guts Man approaches, keep a steady stream of shots headed his way, courtesy of your arm cannon. If he jumps into the air, watch him leap and continue to pelt him with bullets. 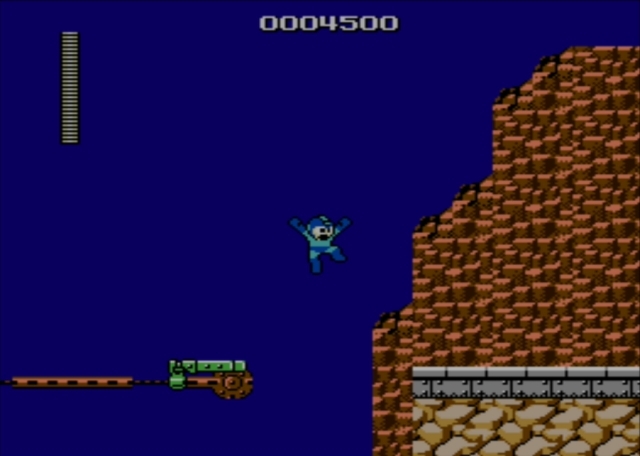 As he is about to land, press the jump button and keep it held down so you manage your highest leap. If you timed it right, you should avoid landing on the ground before it stops shaking. If you land too soon, the shaking ground will stun you and make you an easy target. It's not the end of the world, though; you can make a few such errors and still win. 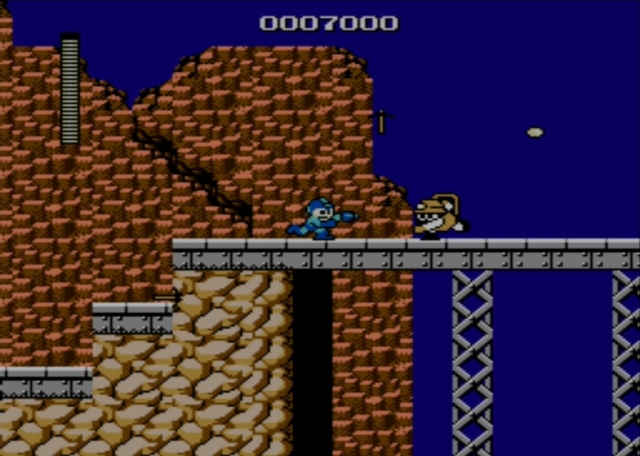 The important thing is to keep firing as Guts Man slowly approaches. Mash the fire button and avoid getting stunned too often and you should have little difficulty outlasting your current nemesis.